Humboldt Redwoods is a large state park that contains over a hundred miles of trails, most falling into two categories - lengthy routes that climb into the hills, and level paths close to the two main highways, Mattole Road and Avenue of the Giants. 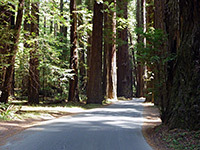 The longer trails mostly encounter small, second growth redwoods and hence are not so interesting, while the remainder, although passing through many fine redwood groves, tend to be short, similar to each other, and subject to traffic noise, especially along the Avenue, where US 101 is never too far away. 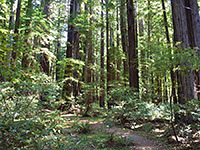 The best hikes are along Mattole Road, close to Bull Creek, since the trees are large, the traffic generally light, and the forest very atmospheric, and perhaps the top route is the 2.4 mile loop along the Homestead Trail and part of the Big Tree Trail (named as Bull Creek Trail South on some maps). 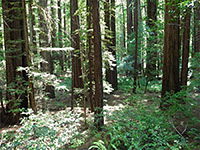 The former runs across flat land on the south side of the road, close to the creek, past numerous majestic redwoods including the Big Tree group, while the latter returns north of the road, a little way up the valley side, where the trees are slightly smaller but the undergrowth is more varied, and the elevated surroundings provide a different perspective of the forest. 24 views of the loop hike, and the state park. The hike begins five miles along Mattole Road (the lower end of which is also known as Bull Flats Road) - a narrow, shady and rather bumpy route - starting at a junction with Avenue of the Giants underneath US 101. The lower section is very scenic, following Bull Creek upstream through very dense forest, where the trees often stand right next to the roadbed, and is more tranquil than the Avenue, which carries more traffic. Shortly beyond the Big Tree area, the forest opens out somewhat though the road stays nearly level for a few more miles before climbing very steeply high above the valley, over several ridges, down towards the Mattole River and on to the Lost Coast. Through travelers probably account for more traffic than park visitors. 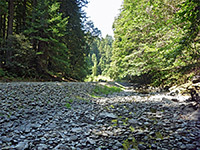 The loop hike can be accessed from several points along the road; the suggested parking location is at a pull-out on the south side, just west of a bridge over Bull Creek, 5.2 miles from US 101. A short walk back east across the bridge reaches the start of the Big Tree Trail, on the south side, approximately opposite a side road to Albee Creek Campground. The trail starts across a patch of grassy, treeless land next to the creek but soon enters the forest, moving steadily away from the road and its occasional traffic noise. The edge of the forest has plenty of undergrowth, but this fades away as the path penetrates deeper. 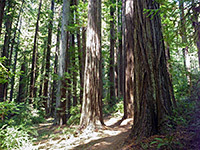 Most redwoods are healthy and upright; there are comparatively few of the fallen or leaning trunks that characterize some other groves in the park. The trail proceeds eastwards, mostly out of sight of the creek but coming close after about 0.8 miles, and crossing the parking area at the end of the spur road to the Big Tree day use area. Another trail forks off to the south, crossing the creek on a seasonal footbridge and exploring other groves on the far side of the stream, which flows very strongly in the spring but is nearly dry by summer, trickling gently through a narrow part of the wide, stony corridor. The main path continues beyond the spur road, through forest now quite overgrown once more, crossing a tributary drainage and linking with Mattole Road just opposite the start of the Homestead Trail, the return section of the loop. Past here, the Big Tree Trail, now rather less used, continues east 5 more miles, all the way back to the Eel River. 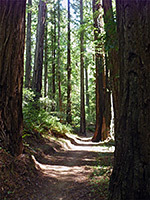 The Homestead Trail, a route shared with horseriders, recrosses the tributary drainage and passes a sign which gives the distance as 1.2 miles (to Albee Creek Campground), soon after which is a junction with the less used Addie Johnson Trail, which climbs 600 feet up the hillside to a small redwood grove and a partial viewpoint. The remainder of the Homestead Trail is across dry, sloping land, partly illuminated through small gaps in the tree canopy that allow patches of sunlight to reach the forest floor, and hence a greater range of understory plant species to grow. Features en route include three small bridges over usually dry streambeds, and a huge fallen redwood, its roots projecting many feet above the path; there are rather more downed trees here than on the flatlands beside the creek. The final part of the path, after crossing the campground road, is out of the old growth forest, descending gently close to Albee Creek, back to the start point along Mattole Road.